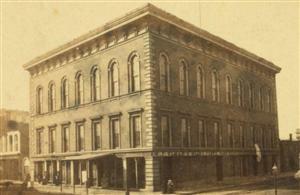 Directions: In 1861, The St. Louis Mercantile Library [ Waypoint = N38 37.706 W90 11.319 ] was located in a building at 510 Locust Street in St. Louis, Missouri 63102. In 1998, the library was moved to its current location on the campus of the University of Missouri-St. Louis. Cross over to the south side of Locust Street. Walk west for about a half block and you should see the 510 Locust Street address and the sign for the Mercantile Library. Description: Again, there is not much to see, but this was a very historic location in 1861 and then later in 1865. 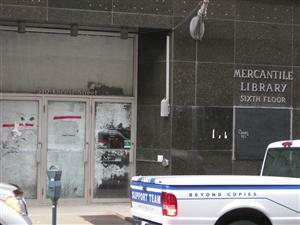 The St. Louis Mercantile Library opened its doors at the 510 Locust Street location in November 1854. This location played a key role in 1861. 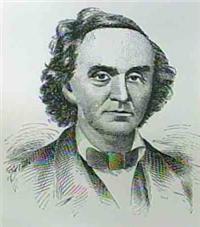 The Missouri State Convention would meet in the library's auditorium in March of 1861. There is at present no adequate cause to secede. The Union shall be perpetuated and harmony restored. The Crittenden amendments are recommended. A convention of all States shall propose amendments to the United States Constitution. Coercion will cause civil war; therefore the military power of the United States and of the Seceded States should be withheld and stayed. The Convention should adjourn to December 3, 1861, or be subject to a call of an appointed Committee. 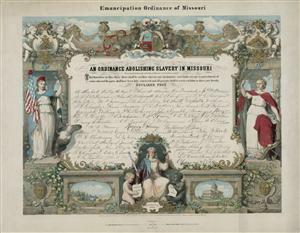 That hereafter, in this State, there shall be neither slavery nor involuntary servitude, except in punishment of crime, whereof the party shall have been duly convicted; and all persons held to service or labor as slaves are hereby declared free. Passed in Convention, January eleventh, A. D. one thousand eight hundred and sixty-five.